We all pave our own paths to success. For you to be successful, you must have the passion, dedication and commitment in what you do. But did you know that despite the differences, most successful entrepreneurs have a couple of things in common? That’s right! And if you want to be successful too, you can add these tips to your daily habits. Successful entrepreneurs start off their day knowing what they want to achieve. They have priorities and their actions and decisions are based around achieving those priorities. Did you want to make your inbox more organized? Was the goal to finally prepare your tax returns today? Did you want to make a more in-depth analysis of your sales? Whatever the goal is or are, you should know what you want and how to achieve it. Successful entrepreneurs don’t start their day in a frenzied way. Instead, they know how exactly their day today will go because they’ve already made a mental program of it last night. It’s good to always have a plan on what your day would look like to help you focus more on your goals. And it’s not enough that you plan for today. Tonight, you should make a plan and tomorrow. Wash, rinse, repeat. Successful entrepreneurs have at least one task they hate doing, but if you want to be successful, you’d rather do such task first. This phenomenon is called in the business world “eating the frog” and it’s an excellent way to avoid procrastinating on the rest of your day’s task. When you do and finish the most challenging task first, everything else pale in comparison. And now that you were able to do the hardest part of the day, you also get a rush of excitement because the rest just seems so easy now. Successful entrepreneurs may be equipped with all the skills and resources to run their business solo, but they also know that they only have so much time in a day and sometimes finishing everything is just plain impossible. Entrepreneurs who also try to do everything themselves may also end up with output that’s lesser quality. Successful entrepreneurs know that should delegate some tasks in their business so they can focus on the core areas. Things like graphic design, social media management, logistics and bookkeeping are better off assigned to outsourced professionals. Some even take a business partner or a mentor on board to further boost business performance. Successful entrepreneurs know that rest and relaxation are important for them to recharge and revitalize, therefore make them more effective in their roles. They avoid burning themselves out. Whether it’s a quick break for a cup of coffee or meditation, a 30-minute nap or a weekend away from work, successful entrepreneurs take a break when they need to, and they don’t feel guilty for it. 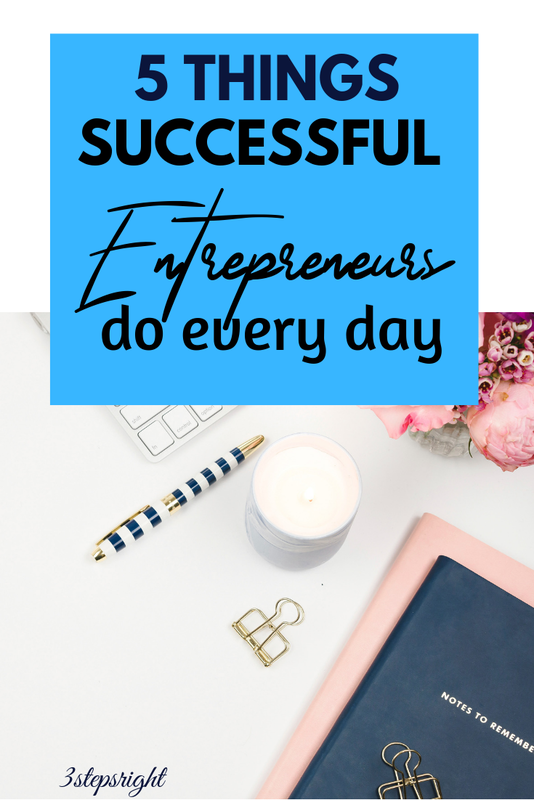 It sure takes a lot to become a successful entrepreneur, but sometimes, things as easy and obvious as these can be overlooked. If you’re looking to take the first few steps towards becoming a successful yourself, 3StepsRight offers a variety of coaching services to get yourself and your business in order. Inquire and book a class with us now. We would be more than happy to help you out!